I had, by (mostly) accident, ended up having to fly around the world. The unfortunate thing is that I didn’t get to spend a huge amount of time outside airports I traveled through or the facilities I was working at. I will note that Turkish Airlines and EVA Airlines are quite nice, and reasonably priced. It turns out the flag carriers of small countries are a huge source of pride, and provide excellent service. 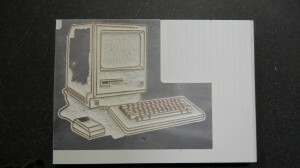 When engraving printing blocks for relief printing, it is often laborious to cut out large, unused areas of blocks. Some artists have turned to Dremels (or equivalent) for expedience. This carries some risk, as a single slip can send the cutting tool skidding across a whole block, ruining it. I wanted to help my better half out and clear some large areas of a block she was carving. 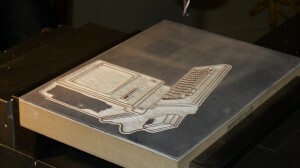 She carves using a material called Resingrave. This material was developed by Richard Woodman as wood engraving medium intended to replace expensive and increasingly depleted end-grain hardwoods, traditionally used for woodblock printing. After corresponding with the helpful folks at McClain’s Printmaking Supplies, I had enough information to try machining the material. 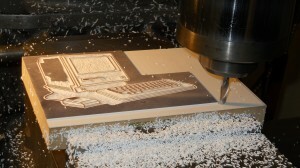 Our goal was to mill away large unused areas of the block to save significant hand-carving time. The picture to the right shows the block in the vise, before we set the cut depth and started machining. There are parallels supporting the block in the vise. Note that the design outline has already been hand-carved, and the rest will be hand-carved once the larger, unused areas are milled down. I used a 1/4″ two flute HHS endmill a geometry typically used to cut aluminum. HSS is probably preferable to carbide, as it will hold a better edge. 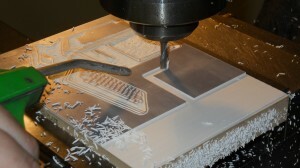 I used a Sharp LMV mill at my employer’s extensive machine shop (with permission, of course). I machined the resingrave at a .055 inch depth, 1000 RPMs, feeding about 12 inches per minute (.006 inches per tooth). We took a .1″ cut with each pass, except for initial full-width cuts into sections of the block, as seen at right. This was a conservative and slower method, but there was no reason to rush. Those familiar with Bridgeports, clones, and many manual domestic mills will recognize that distance as a half turn of the crank, making the math easy on me. The block turned out well, and made quite the mess of small, louse-like, clingy chips. 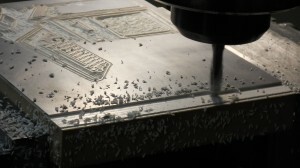 The uniformity of these chips was important, as it indicated that my milling was fairly consistent. I took advantage of the X-axis power feed for the long cuts along the bottom of the block. One of the critical things was keeping the cutter and block free of chips. I used light compressed air, and occasionally brushed the cutter off. Best of all, the artist was happy. The block suffered no damage, and hours of removing unused material was saved. Her take on the process is here. For those who want more machining details, read on. Taking my speeds and feeds, I could reverse the usual calculations and find the surface feet per minute. Calculating this out, my SFM is about 65…I assume the theoretical maximum SFM of the material is significantly higher, but I didn’t want to recklessly hog out something that was on it’s way to becoming a really cool piece of art. There was no difference between climb milling and conventional milling. I took passes in both directions without worry. Given the softness of the material, the slow feed, the shallow cuts, and the relatively tiny end mill, I felt climb milling was safe. Coming soon: An actual print pulled from the block. See it at Folio CIII. Not a bad wrench position. For the past week, I’d been neglecting my car. The driver’s side lock cylinder was loose, and I wasn’t looking forward to disassembling all the interior body paneling and removing the window mechanism and glass to fix it. Unfortunately, it all came to a head last night, as the bolt holding the lock cylinder in place made a resonant clanging as it fell into the depths of the door. Fortunately, I drive a moderately antediluvian Subaru Impreza. Upon removing three retaining screws, the interior paneling came off easily. Then, when I recovered the bolt and rolled down the window in anticipation of removing it, I realized something neat: The window comes down it’s tracks and moves slightly towards the front of the door, uncovering the interior side of the door handle/lock cylinder. 10 minutes later, I had the lock mechanism tight, the interior paneling back on, and an operating lock. Some mechanics say that there isn’t a bad wrench position on a Subaru. I would tend to agree.